Today, I’m sharing last weekend’s adventure with Motor Man and his mom. And let me just say that it was something quite different for her. We picked her up around mid-morning and headed for the Outer Banks. She thought we were just going to check on our beach house, have lunch and drive back home. 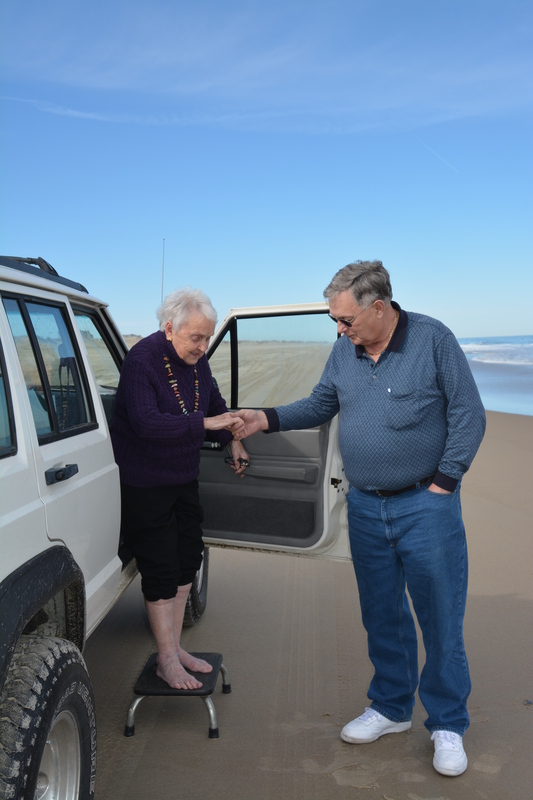 Once we were in the Outer Banks, we helped her into our Jeep and off we went out onto the beach at Corolla. She didn’t care much for bumping across the sand. She didn’t care much for Motor Man driving so close to the ocean. We only saw four horses, and none of those were on the beach (or even in good spots for photographs). She didn’t seem to be enjoying the adventure very much. By the time Motor Man got the step stool from the back of the Jeep, she had already taken off her shoes and knee-hi’s. Motor Man thought she was just going to get her toes wet; he’s still wearing his socks and shoes. Motor Man’s smiling here, but he had to endure soggy socks and shoes for the entire trip home. I had set up our camera on the tripod as Motor Man was helping his mom out of the Jeep, so even though both of them had cold, wet feet, we managed to get a “group picture”. We helped Mom dry her feet right away and turned on the heat in the Jeep. Then, with her socks and shoes back on, we treated her to a nice dinner and delivered her safely back home. I think this trip will give her something to talk about…until her next adventure. 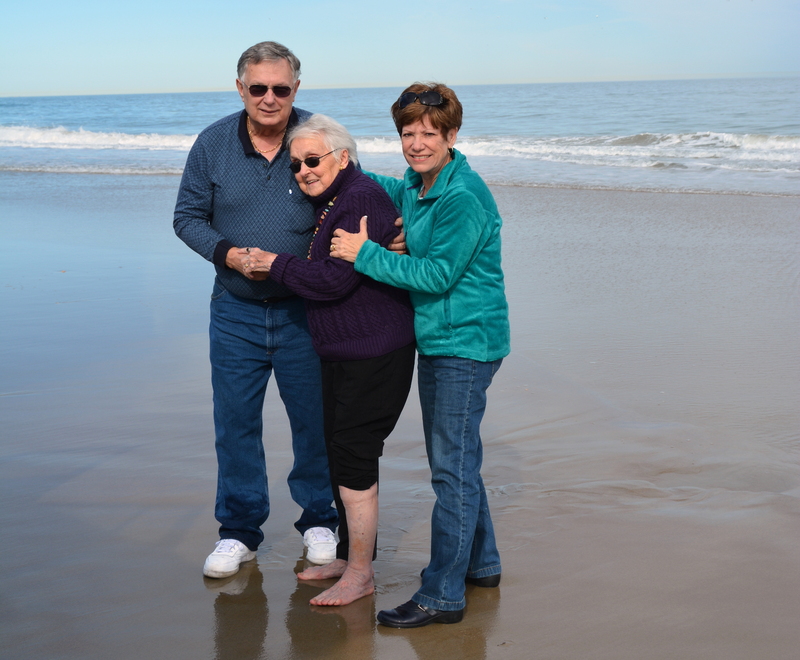 This entry was posted in Family, Traveling Days and tagged corolla nc, OBX, outer banks. Bookmark the permalink. There is so much love in these photos! Really touched my heart .. I’ll bet that water was chilly!! Great photos and no doubt Mrs. K will think about that moment in the surf with JR for a long time to come…..sweet memory. What’s that poster I’ve seen in classrooms? “Life is a daring adventure or nothing.” — Helen Keller Joy, love and embracing the unexpected make memories. Great photo story! A fun day was had by all. So sweet! Awwww – this is the sweetest post. Pictures to be treasured! Love seeing the whole series Dianna! The WHOLE story! The big picture!! Motor Man and his Mom are charmingly adorable in picture #5!!! Waves have a way of taking you by surprise! How fun?!!!! It’s important to stop our hurry up lives and smile once in a while. Take pleasure in making others happy. This just made me smile this morning! How cool! I love her spirit and the drive to dip her toes in the water. There must be a lot of good in a man so willing to help his mother, and in the daughter-in-law photographing the pair of them. Blessings to all three of you! These weekend adventures are something I’m sue Mrs. K treasures! What a fun day that was…..even with MM’s soggy socks and shoes! Oh my goodness! That is so sweet it brought tears to my eyes. How blessed you are to still have Motor Man’s Mom with you and what a blessing you are to her, I’m certain. 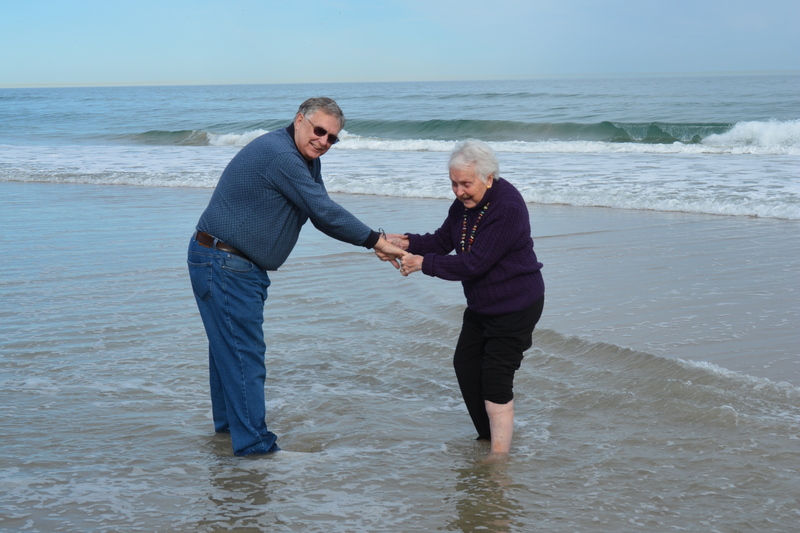 My mom wanted to do the same thing in the Pacific Ocean when we lived in Oregon, although at the time she was younger than MM’s mother. Unlike you though, I didn’t get a photo of that. You’ll treasure these pictures! Oh, that just made my day. How spontaneous and exciting. If my former sister hadn’t kidnapped my Mom (91) and hauled her off to SC, I’d do the same in a heartbeat. So delighted you captured the day and shared. oh, she’s just precious! loved this! This is really beautiful. I think she will carry the memory of the little adventure for a long time. Lots of love to you all! Dianna, you know and I know, and I’m sure Motor Man as well, how very, very special these pictures are. Brings tears to my eyes. And it was nice to see the big guy smile! That’s always a special treat! Very sweet! I’m sure she enjoyed it all, especially the fact that you’re giving her attention and love. Again you can see the love between a Son and his Mother. These are the sweetest pictures and tell the whole story. What wonderful photos to treasure forever. LOL, this was too funny! COOL!!! Literally! These are treasured pictures of treasured memories. Thanks for letting us in to enjoy. What sweet and caring “kids” you two are! These photos show it and how happy your mother-in-law looks to be sharing these moments with you both. My mother-in-law would have done the same thing! We are truly related! Poor MM, that had to be a bit uncomfortable the rest of the day. 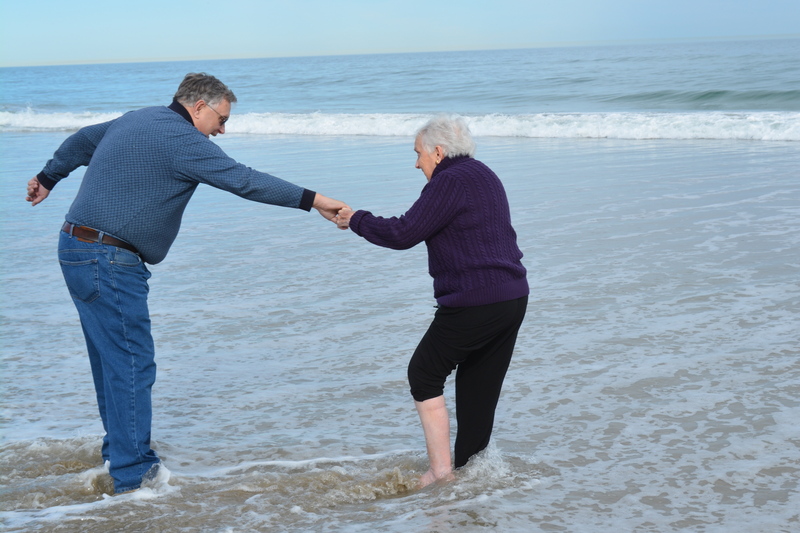 Reminds me of the commercial: Shoes $$, Socks $$, helping your mother dip her toes in the Atlantic, Priceless! Great shots. This is so sweet and brought tears to my eyes. 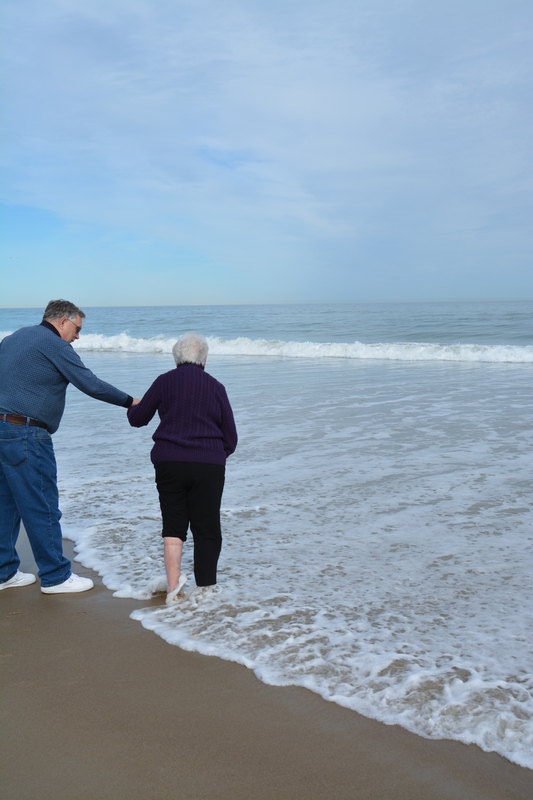 It’s awesome you all take MM’s Mom for drives and let her enjoy nature and fun things like dipping her toes in the ocean. Love it!